The twin headstocks and nearby disused mineral railway track are all that remains of an extensive coal mining enterprise carried on by Barber, Walker & Company, who first leased and then bought much of the parish of Brinsley from the Duke of Newcastle. They are a memento of both Brinsley’s mining heritage, and the literary heritage of DH Lawrence, whose father worked at the colliery. Many of Lawrence’s stories are based on this area and the people who lived and worked here. Two hundred years ago numerous shallow mine shafts were scattered about the parish, extracting coal from the Top Hard seam. Coal was carried by packhorse, carts, and later by horse-drawn tramcars, down to the Brinsley and Beggarlee wharves on the Cromford canal at nearby Langley Mill. From there it was transported by canal all over the Midlands. Eventually these shallow pits went out of use, and efforts were directed at extracting coal from further below ground. There was a pit on this site from at least 1807, but in 1872 a second shaft was dug and the existing one deepened, in order to extract coal from the Deep Hard seam. This was about 3 feet thick, and some 780 feet below the surface. For some time Brinsley was unusual in having twin shafts and two cages for the transport of men and coal. Until an explosion in 1883 which resulted in the death of two men, naked lights were used in the pit, but thereafter safety-lamps were used. The colliery was worked from 1872 until 1934, and was then used for access to Moorgreen and Pye Hill pits until 1970, when the surface buildings were demolished. 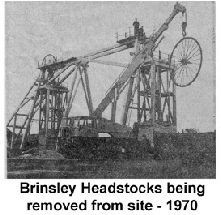 The headstocks were taken to a mining museum, but returned to Brinsley in 1991, where they were re-erected on their present site. Between 1850 and 1860, privately built mineral railways linked Barber & Walker’s collieries at Brinsley, Watnall, Selston/Underwood, Moorgreen and High Park to the canal wharves for onward transport. The company was part of a group who met at the Sun Inn, Eastwood to set up the Midland Railway Co, as a means of improving competition regarding the supply of coal to Leicester and other places. The remains of part of the mineral railway network can be seen to the east of this site - it is now a footpath which forms part of the nature reserve. With tramways and a mineral railway line criss-crossing the parish the whole area would be very different in its mining heyday from the peaceful heritage site of today.